You decided to learn more about the keto diet and what happens to the body in the state of ketosis. This type of diet is a low-carb high-fat way of eating that comes with many health benefits all backed by many scientific studies. Eating a ketogenic diet may help you lose weight, improve general health and it’s shown to have a positive effect against diabetes, epilepsy and even cancer. I created this short and comprehensive guide to help you understand the basics of the keto diet. A ketogenic diet is also known as keto is a high-fat, low carb and moderate in protein diet. Eating more fat and small amounts of carbs help your body to enter ketosis. Ketosis is a state where your body switches the primary fuel to ketones (instead of glucose). Your liver produces ketones, from fat that are used as fuel both when the food intake is low or when we eat fewer carbs. This new fuel is preferred even by the brain over, and it can run solely on fat. Our body can adapt very well to different situations. You can also produce ketones when you are fasting (not eating), but I’m not sure if we can live without food forever. Many people start lowering carbs with the goal of weight loss and most of them encounter great success. Burning fat for fuel is excellent because you eat tasty foods you’re not hungry all the time. Studies show that low carb high-fat diets are better for fat loss than any other way of eating. Studies show that eating foods high in fat and restricting carbs, while eating to satiety will help you feel less hungry over the time. Ketosis prevents the hunger hormone (Gherlin) to rise. You’ll have no desire to eat, it also helps with stress eating and the hunger will disappear. Many people notice an increase in energy levels. Ketosis is a more reliable energy source that keeps your body steadily fuelled, and you avoid big blood sugar drops. Brain fog will be gone for good. Reduced blood glucose: The level of blood glucose significantly reduced. It’s an excellent method to reverse type 2 diabetes, to prevent it or to keep it under control. Standard ketogenic diet (SKD): This is the most common versions and the one I recommend if you are just starting. The rules are to consume 20-50 grams of net carbs per day. 75% of your diet should come from fats and 20-25% from protein. Targeted ketogenic diet (TKD): This type allows you eat 20-50 grams of net carbs before working out. Great for very active individuals to maintain the exercise performance. Cyclical ketogenic diet (CKD): means you alternate the carb intake during the week. You keep the carbs at a minimum for 5-6 days then, you have a few high carbs days. It comes under the name of “carb loading.” If in the low carb days you aim for less than 50g carbs in the load phase you consume about 500 grams of carbohydrates. This type is best for bodybuilders or athletes to help maximize the fat loss while building lean muscle mass. High-protein ketogenic diet: This is remarkably similar to a standard ketogenic diet, except you include more. You can try eating 60% fat, 35% protein and 5% carbs. To be successful, you should start by understanding the basics and what are the allowed foods. Meat: Steak, sausage, bacon, chicken, salmon, trout, tuna and mackerel, turkey, etc. Eggs: High in protein and healthy fats. Nuts and seeds: Almonds, macadamias walnuts, flax seeds, pumpkin seeds, chia seeds, etc. Healthy fats: Extra virgin olive oil, coconut oil, and avocado oil, etc. Low-carb vegetables: Peppers, cauliflower, zucchini, broccoli etc. Leafy Greens: Spinach, kale, lettuce, etc. Sweeteners: Stevia, erythritol, monk fruit, etc. Berries: Rasperries, blackberries, blueberreis, etc. 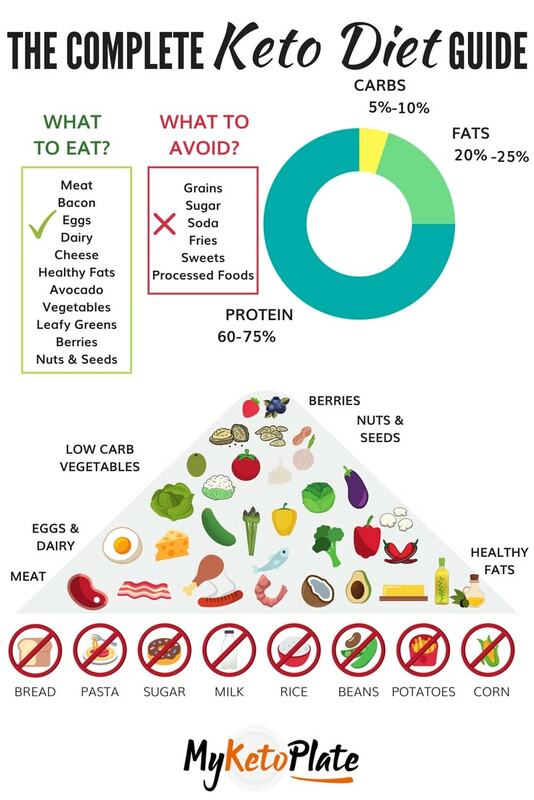 Keeping a low carbohydrate intake may seem hard if you don’t know what foods are high in carbs and should be avoided. Processed sugary foods: Sodas, fruit juice, cake, pastry, ice cream, candy, etc. Grains: Wheat products, rice, pasta, cereal, corn, etc. Fruit: banana, apple, peare, orange etc. Tubers and root vegetables: potatoes, yams / sweet potatoes, carrots, parsnips, etc. Low-fat or diet labeled products: These are highly processed and often high in carbs.